What if The Bullet Club invades WWE? When WWE signed AJ Styles, Luke Gallows, and Karl Anderson away from New Japan Pro Wrestling, rumor had it that they also approached the Japanese promotion about buying the intellectual property rights to the Bullet Club. New Japan held fast, and WWE teased its own slant on the faction as just The Club or The Balor Club with former Bullet Club leader Finn Balor at the helm. WWE has never gone full tilt into pushing a formal stable, however, and aside from a handful of programs and one off matches, all Club affiliations have remained lax and impermanent. The latest rumor is that All In caught WWE’s attention, and while Vince McMahon doesn’t feel threatened, he’d nonetheless like to nip any semblance of competition in the bud. Between their entrepreneurship and being among the hottest acts in wrestling not already signed to WWE, McMahon is reportedly interested in bring back Cody Rhodes and signing The Young Bucks, and potentially bringing in Kenny Omega and other wrestlers affiliated with The Bullet club as well. So what if McMahon does sign these talents, and especially if they were to debut as a stable—with the Bullet Club name or otherwise? This article looks at five prospective results. 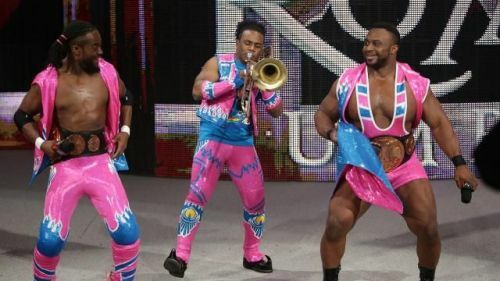 New Day vs. The Young Bucks and other dream matches may be on the horizon. There’s a lot of talent in The Bullet Club, but The Young Bucks may be the most special of all. They’re a fast-paced, high-flying, increasingly veteran tag team that has earned main event status in Ring of Honor and New Japan. As WWE enjoys a bit of a tag team renaissance, particularly on SmackDown, there are a lot of first time dream matches awaiting Nick and Matt Jackson if they sign, ranging from The Usos to The Bar to The Bludgeon Brothers. The Young Bucks vs. The New Day may be the most appealing possibility of all, pitting two of the most celebrated, high profile teams of their generation against one another. Both teams are great on the mic and at cultivating their brands. Both teams can deliver in the ring, and a program between these two sides could be something very special and produce its share of unforgettable matches. What if Cody Rhodes never left WWE?